Office stationery is important for any business and office, which is why we offer office stationery printing services for various sizes like rectangle, oval, square, rounded and much more. We can also customize all your stationery in different designs and colours. We use high quality papers with attractive prints on various types of mediums which are long lasting and easy to use. While we accept both small and large orders, we make sure we supply your order in the stipulated time frame. The office stationery printing services we offer include letterhead printing, business card printing, envelope printing, diary printing, organizer printing, calendar printing, sticker printing, label printing, certificate printing and corporate printing. 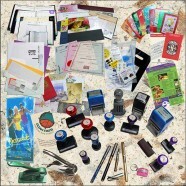 We have the expertise, personnel and equipment to print premium range of stationery in various colour and design options. We focus on your customization needs and accept letters, mailers, quotations and messages and accordingly develop designs and offer the required printing solutions. Once you approve the design, you get to choose your printing medium and colour combination to use on your stationery while printing.